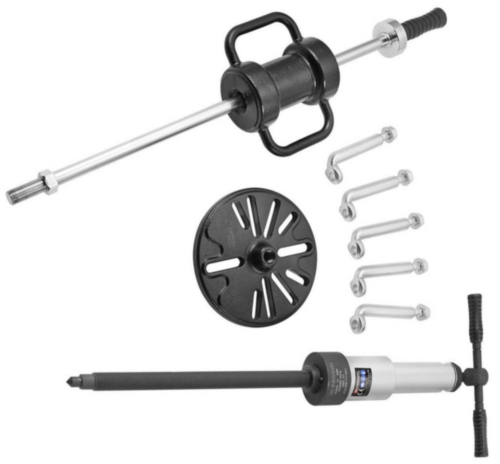 Complete set comprising: One hydraulic screw U.3 power 10 t, stroke 14 mm, threading M22X200. Slide hammer U.2A of 9.8 kg ideal for SUVs, 4X4, Light utility vehicles. Rod length 750 mm, threaded length 70 mm. Diameter M22. Tray U.9-01A diameter 236 mm. central threading M22. Suitable for 90%+ automotive fleet thanks to may solutions offered and the 5 legs. 1 set of 5 legs U.9-02, length 169 mm. Diameter for wheel axles up to 16 mm.